To persuade a jaded audience to watch advertisements and buy products, advertisers have come to rely on product placement. Here’s a history of this popular strategy. Product placement is a type of advertisement in which an advertiser pays to prominently display a product as a part of scene or story in a television show, movie, magazine article, or another form of media. If it seems to you that this kind of advertising is more common than ever, you’re right! Here’s a short history on product placement and why it’s everywhere these days. Product placement, as we know it today, has only been a popular phenomenon since the 1980s. Before the 1980s, if a movie or TV scene accidentally showed a glimpse of a product, the media company had to pay the makers of that product a fee. The turning point for product placement occurred in the 1980s with a very popular movie—E.T. The Extraterrestrial. Of course, this film contains the famous scene when Elliott coaxes his hungry extraterrestrial visitor out of the shed with a trail of Reese’s Pieces. 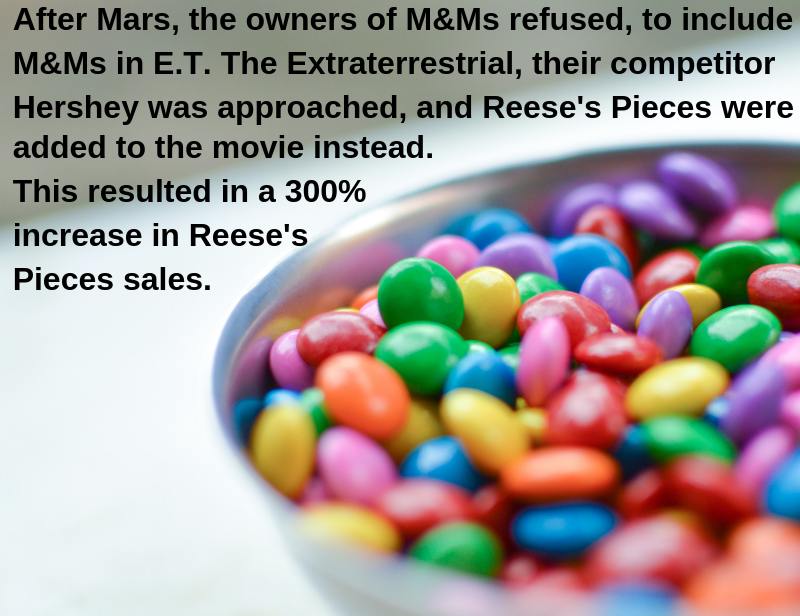 The Hershey Company was paid for the privilege of using its product in the movie. But when the sale of these previously obscure candies skyrocketed, media makers realized they were doing things backwards, and that companies should be paying them for using their products in movie and TV scenes and storylines. Thus, during the 1980s, product placement quickly became a common practice in movies, and gradually in TV shows as well. Some of the earlier attempts at product placement were funny because they were so poorly done; for example, in Back to the Future, audiences laughed at scenes where brands of soda were discussed as the camera zoomed in close to the cans. As time went on, though, product placement became more sophisticated. Today, advertising quietly becomes part of the plot of some of our favourite TV shows and movies — whether it’s Rachel trying to sneak Pottery Barn furniture into her apartment past antique-loving roommate Phoebe on Friends, or whether it’s hungry reality show contestants on Survivor competing in a reward challenge for the opportunity to pig on Pringle’s potato chips. In fact, one of the most common places to see product placement — often in its most obnoxious, obvious form — is on reality TV. Many programs work product placement into the show’s challenges, whether it’s Apprentice candidates creating competing marketing campaigns for a new variety of Domino’s pizza, or America’s Next Top Model contestants shooting competing ads for Cover Girl. Products find themselves placed all over these programs, even as the American Idol judges rate the contestants and sip their Pepsis. Why has product placement become so common? Because it works. In today’s hypercompetitive advertising climate, product placement is a strategy that gets messages out to consumers, whether they like it or not. On television, one primary reason why there’s so much product placement is because it’s become so easy to block out traditional commercials. Thanks to the remote control, VCRs, DVD burners, and especially DVR players (like TiVo), it’s easy for audiences to skip right by the ads. With product placement, the ads become the content, and they can’t be skipped. Another reason why product placement is so common is that audiences have become positively jaded by advertising. While audiences in the 1950s found ads entertaining enough to watch them from start to finish, today’s audiences are both sceptical about corporate appeals and bored by the constant stream of ads we see everywhere in our lives. Product placement brings entertainment value to ads by incorporating them into storylines. The astronomically rising prices of TV and movie production also has contributed to the popularity of product placement. By selling products inside the show as well as during the commercial breaks, the industry taps into a whole other source of revenue. In today’s advertising-saturated world, product placement has become an everyday strategy that advertisers use to make sure that their products are visible to consumers. As with all ads, consumers need to be aware of these appeals and evaluate them with a critical eye. Take a moment to open a spam folder or peruse the daily handful of snail mail credit card solicitations. Advertisers, marketers and copywriters spend billions of dollars every year trying to convince potential customers to spend their hard-earned money. And despite recent hype about the new challenges facing the digital-age advertising industry, the reasons people buy largely remain the same. Free – Despite abuse by unscrupulous internet get-rich-quick schemes and overzealous email marketers, this remains the most powerful word in advertising. 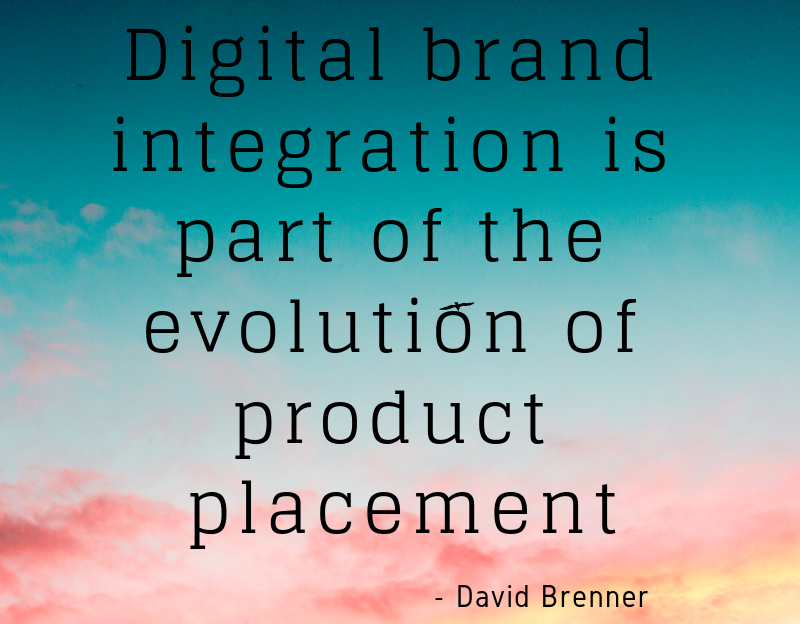 According to Roger Dooley of Neuromarketing, “FREE! is more powerful than any rational economic analysis would suggest.” Studies show that two thirds of buyers prefer a free, low-quality product, over a heavily-discounted, high-end competitor. A free offer is very difficult to resist. 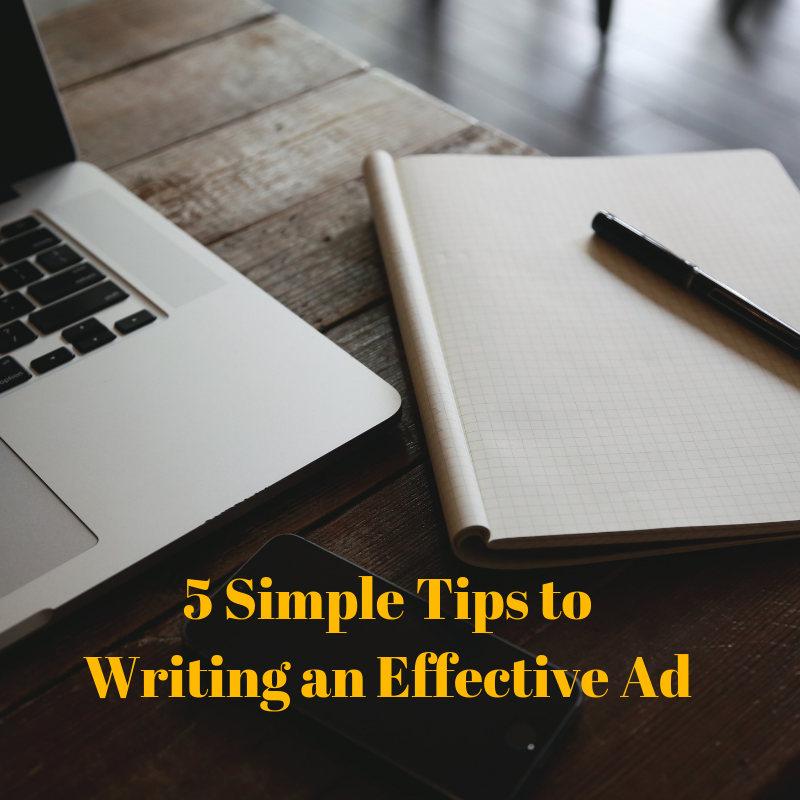 To take advantage of this powerful advertising buzzword, be sure to draw attention to it. Use all caps, italics, boldface or a different color to set it apart. Research has shown that readers will typically scan a document before reading it. They look at headlines, bullet points and other attention-getters before devoting their time to reading the copy. Keep in mind that though bulky text is often initially ignored, it is the meat and potatoes of the ad that not only explains precious details, it also provides the necessary stage from which a star buzzword can shine. Use the word ‘free’ diligently and responsibly. Customers, especially online customers, are very wary of those offering something for nothing. Unless a plausible explanation is given as to why a company is offering this great deal (grand opening, under new management, anniversary, year-end sale, overstocked, going out of business, etc. ), using this powerful attention-getter will not create any value and can even turn buyers off. Look at the marketing campaign from the customer’s point of view. Why is the offer special? The better the deal customers think they are getting, the more likely they are to buy. The word ‘free’ is a great attention-getter, but it’s just an empty word if there is no incentive for the customer to act quickly. Using advertising buzz words can help with Google page ranking and improve customer response in direct marketing campaigns, but they need to be coupled with a call to action to reap the most rewards on each advertising dollar. A compelling ad is one of the most effective internet marketing tools. When you are able to come up with ads that sell, your business will start hitting your sales goals in no time. Businesses with virtually unlimited advertising budget tap the services of advertising professionals for their ad requirements. Great, right? But the truth is, not every business owner has the budget for that. Small business owners need to learn how to create ads that sell. Fact: People will buy from businesses they can trust. When writing your copy, take time to convey that they will be dealing with an establishment with years of experience in the industry. You can include where you are based and how long have you been operating. There’s a reason for those “Est. _____” texts you often find in print ads and logos. If your small business received awards or certifications, include them as well because those things are proof of your credibility. Showing proof of your credibility will remove any doubts and convince people to try your product. When done right, testimonials can really move your business to greater heights. 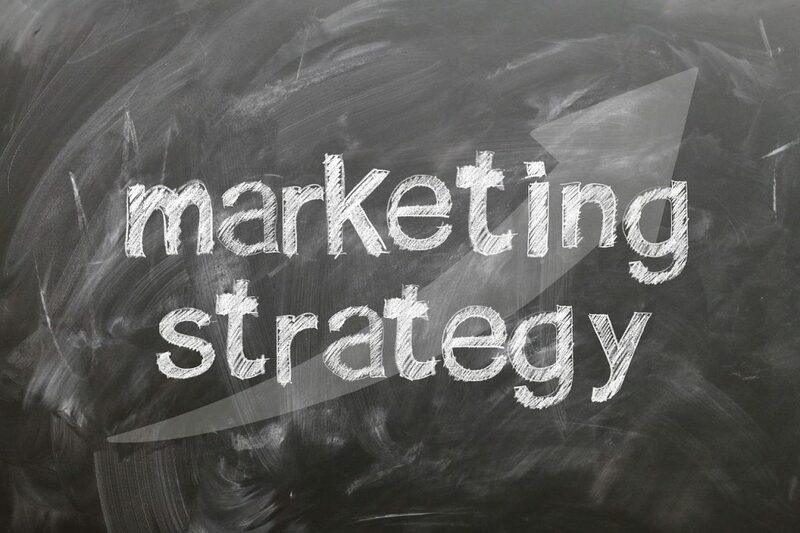 It is a very effective advertising and marketing strategy that business owners should take advantage of. Why? When people hear or read great things about what you’re selling, they will be persuaded to make a purchase. When including testimonials in your ad, ensure that everything is believable. Include photos or video clips whenever possible. Skilled advertising and marketing professionals use emotional triggers in the copies that they write. People are driven by emotions. And emotional states affect decisions. When you are able to appeal to people’s emotions, they will be enticed to react in ways that will positively impact your business. Your CTA or call to action statement will give your sales pitch that extra push. Use exciting and powerful language like “buy NOW” or “Get your FREE ____ today!”. Communicate a sense of urgency, and encourage them to act immediately to enjoy big savings. By writing killer CTAs, you will be able to bring in more sales! Did you find these tips helpful? Drop us a line in the comments section below!